This morning we had breakfast together and then walked over to the canal. 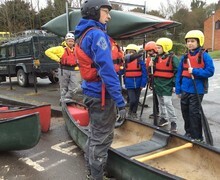 Half of the group went canoeing where they learnt how to steer the canoe in small groups. They then played a variety of games in their canoes. Children were excited to catch the rubber duck and small welly! While the children were canoeing, the other half of the group went on a Town Trail to learn more about the history of Devizes. 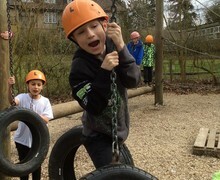 The children then swapped activities. We then walked back to Braeside and had our lunch and talked about our time with Yousaf. 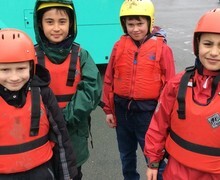 Children really enjoyed the canoeing and most said that this was their favourite activity! I think the children (and adults) will sleep well tonight! Thank you for waving us off at school this morning. We had a good journey to Braeside but it did take a bit longer than planned. 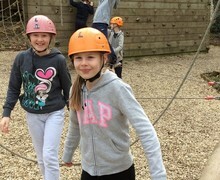 Once we arrived at site we quickly sorted our things and then got straight into activities. 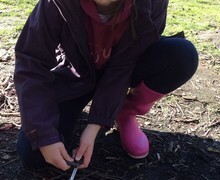 This morning we split into two groups and built a campfire. We then toasted breads twists and ate these with jam! These were a big hit with everyone in the group. 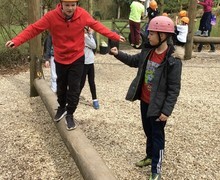 After a picnic lunch (out in the beautiful sunshine), we went and completed a variety of games and activities on the low ropes. The Year 5's are working so well together to support each other as one year group. They are forming much better friendships. 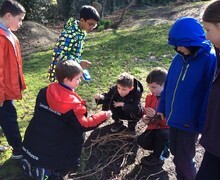 In the afternoon, we split into smaller groups and took part in a range of problem solving activities. 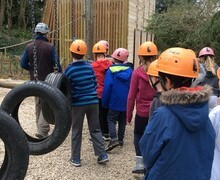 These included getting all of your team through a spider’s web, balancing on a wobbly platform and getting across a swamp with only 3 crates and a plank of wood! There are some great photos of these to share later. After dinner we grabbed our torches and went on a night walk. Children guided their partners through the woods (it was very muddy and a few of us skidded!) holding onto a rope for guidance. Fantastic emerald power was shown by all!